West Windsor, N.J. – The Mercer County Holocaust-Genocide Resource Center and Mercer County Community College (MCCC) invite the community to a reception and reading with award-winning children’s author Rebecca Upjohn on Wednesday, Nov. 19, starting at 4:30 p.m. 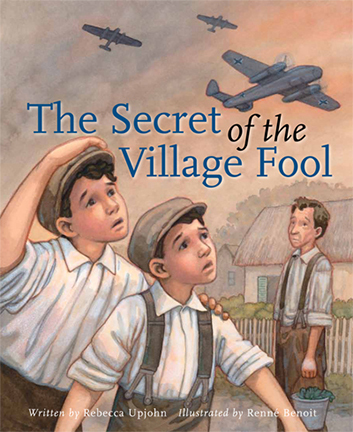 Her book, entitled: “The Secret of the Village Fool,” recounts the story of an improbable hero and the Polish Jews he saved during World War II. Two of the children he saved were Shelley Zeiger (Milek in the story) and his big brother, Michael (Munio). Shelley Zeiger's family members – his wife, Marion, and children Jeffrey and Jennifer – are hosting the reception in his memory. The event will be held at the Conference Center on Mercer's West Windsor campus, 1200 Old Trenton Road. The $25 ticket price includes a copy of the book signed by the author. Additional copies of the book will be available for purchase ($19.95) at the event and up through the holiday season. Proceeds from ticket sales, sponsor donations and book sales will help to establish the Shelley Zeiger Memorial Scholarship for MCCC students studying business. Zeiger, who passed away in 2013, was a longtime champion for business in the city of Trenton and helped bring the Marriot Hotel to the city in 2002. His business connections in the former Soviet Union led to a sister-city pact between Trenton and the Central District of Moscow in the late 1980s. He coordinated visits by the Bolshoi Theatre and Kirov ballets to Trenton, among other cultural events, to benefit local charities and nonprofits. He was a director emeritus for the MidJersey Chamber of Commerce. Award-winning children's book by Rebecca Upjohn tells the uplifting rescue story of Shelly and Michael Zeiger. MCCC President Patricia C. Donohue notes that since the opening of the county’s Holocaust Center at MCCC in 2003, the center has provided invaluable learning opportunities about the Holocaust and other genocides for Mercer students and the community at large, including K-12 teachers and their students. "This event is another example of the meaningful activities this 11-year-old partnership has brought to the college," she said. During the reception, Upjohn, a Canadian author who learned of the Zeiger family story through a colleague in New Jersey, will read the book. Also participating will be Shelley Zeiger's brother, Michael, who was rescued along with Shelley by Anton Zuchinski, the book's hero. There are also opportunities for sponsorship at higher giving levels. For more information or to purchase tickets, call (609) 570-3616.